Discover Lively Lemon Essential Oil And Its Rejuvenating Properties. What a delight lemon essential oil is to use! 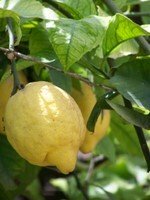 Not only is the citrus, zesty aroma wonderful as a fragrancing agent but it has terrific health properties too. This versatile aromatherapy essential oil is antiseptic, antibacterial and useful as a water purifier. It has well known cleansing properties and is used in skin care, hair care and household cleaning. It's wonderful, when added to water, for cleaning and deodorising your house.....especially if you have pets! It can help you to slim........and help with cellulite. Citrus, light and slightly sour. Juniper, chamomile, lavender, geranium, black pepper, ylang ylang, eucalyptus. Has the ability to stimulate the body's own defence, so is useful for infections such as throat, colds, bronchitis and flu. It is a powerful bactericide - helpful for treating cuts and wounds. It is also haemostatic - helps stop bleeding. Lemon can help bring down temperature - lemon juice squeezed into water sweetened with honey is a good remedy. It is a good tonic for the digestive and circulatory systems - I have a hot lemon drink first thing every morning! A mouthwash of lemon juice and water is good for the gums, gingivitis and mouth ulcers. Lemon essential oil can be used to help get rid of warts and verrucas. Either use neat or a couple of drops in a little cider vinegar - apply daily making sure that you avoid the healthy surrounding skin. Cover with a plaster by day but leave open at night. You may want to alternate with tea tree oil. Useful for easing anxiety and helping headaches and migraine due to nervous tension. Excellent for focussing and improving mental clarity - a good oil for meditation. Some believe that this oil has anti-ageing properties - wouldn't that be wonderful! However the benefits from its qualities such as helping with cellulite and wrinkles, the fact that it is a tonic mentally and physically and an anti-acid could all contribute towards feeling rejuvenated! An astringent oil so is great for greasy skin. Its antiseptic properties make it useful for treating acne, spots and boils. Lemon is a mild bleach so can be used on discoloured skin, for example on your neck. Be warned - use in low dilutions as it can cause skin irritation. Phototoxic - avoid sunlight and sunbeds for at least 12 hours. Use in low dosages as can cause skin irritation no more than 2 to 3 drops in a bath. Fresh lemons were taken to sea by our seafaring ancestors to help prevent scurvy. If you add a drop of lemon oil to your water your body interprets this as food so it stops you from feeling hungry! Put a few drops on a cloth and add to your laundry for a lovely clean and fresh aroma. It contributes well to synergy so is very useful when blending oils.